Maintain a relationship with other objects that around the picture such as a sofa, other pictures, a lamp, etc. Never have too much space between objects. Keep objects at eye level and consider how you can view them when seating in a room. Better to hang lower than too high. 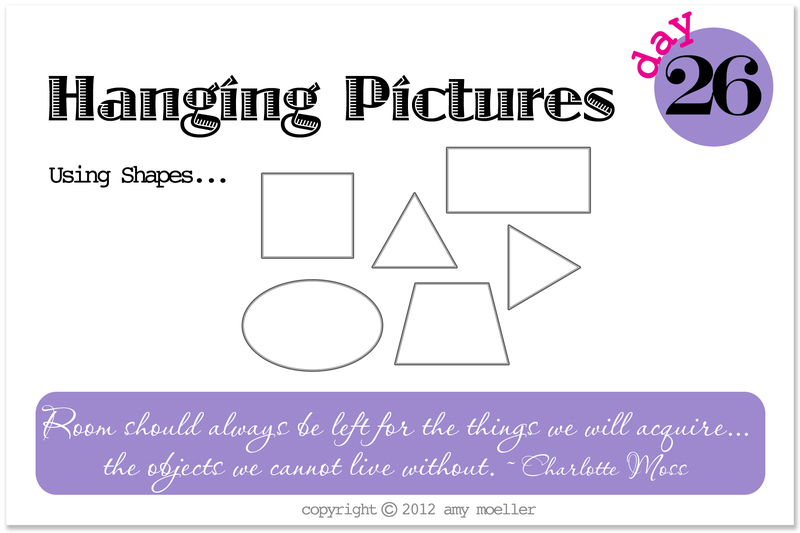 When grouping pictures and objects on a wall, lay them out together on the floor using a shape as a guide for how to arrange them. Assignment: Explore your inspiration file and magazines for examples of successful wall groupings that are based on shapes. A room without accessories is a room that lacks personality. Accessories transform your house into a home. 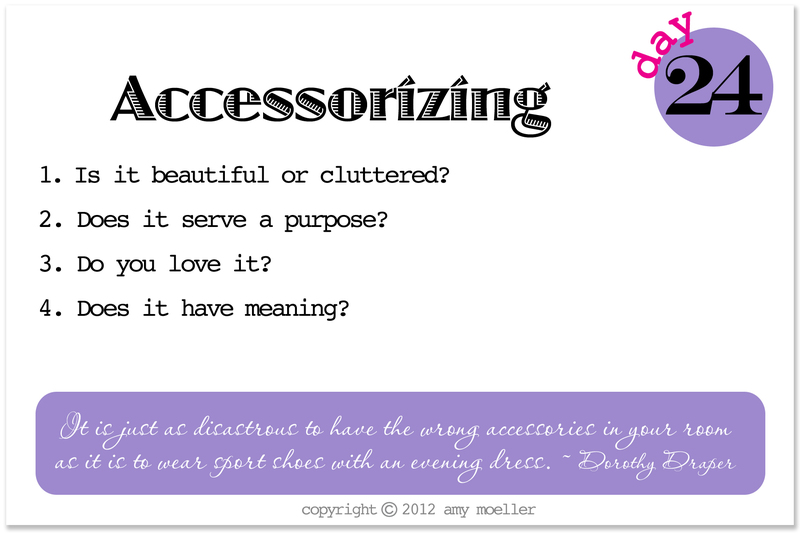 When choosing accessories, ask yourself the following questions… Do I find this to be beautiful? Do I love it? Does it serve a purpose? Does it have meaning? Everything you place in your home should be on purpose. If you asked yourself the above questions about an item and the answers are all no, then don’t include it in your room – it just becomes clutter. 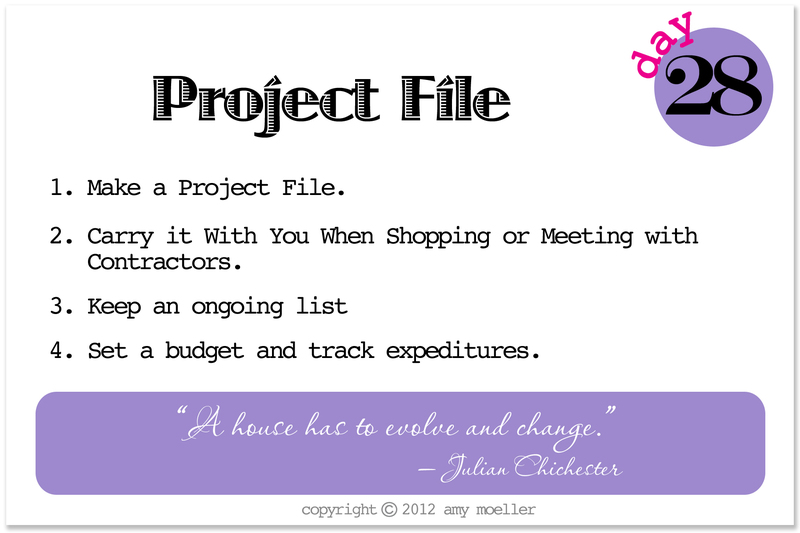 Assignment: Review the accessories in your home and make sure they pass the criteria above. If they don’t pass, pack them up and give them away. 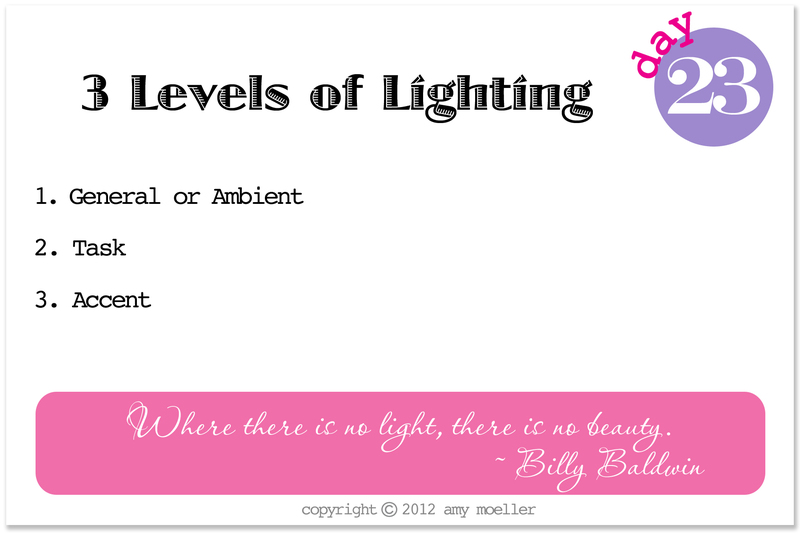 There are 3 levels of light that should be used within every room. Lighting is the quickest way to set the mood for a space…. General or Ambient Lighting fills a space and provides overall lighting to a room. Sources include natural light (sunshine), overhead fixtures, large pendants, floods and chandeliers. Task Lighting is light directed to a specific area for a particular activity such as reading or cooking within a space. Accent lighting adds beauty, warmth and character to a space and is often used to highlight a specific item or area. Assignment: Look at the lighting within your home and make sure that within each room you have all 3 layers. Search magazines and the internet for light fixtures to add to your inspiration file. 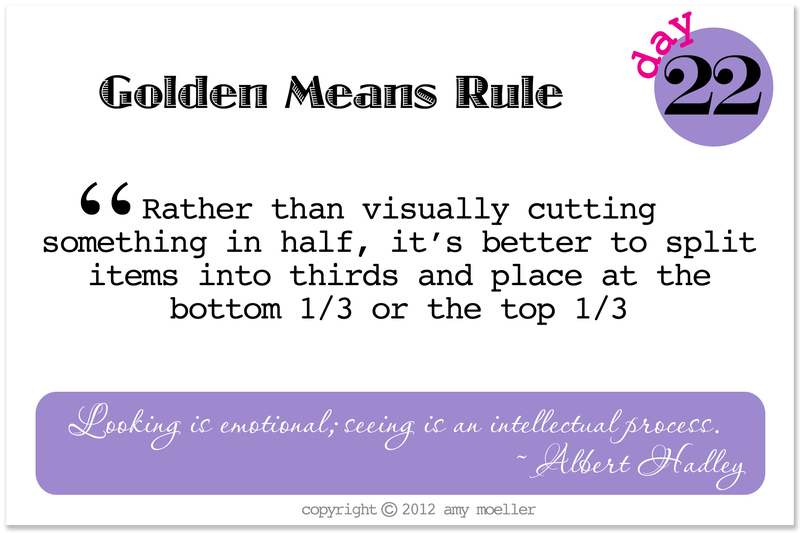 The Golden Means Rule specifically deals with aesthetically pleasing proportions and ratios between two elements. Apply it to everything from placing drapery tie backs to hanging photos and more. In a nutshell you should never visually cut anything in half, but try to maintain a ration of 1/3 to 2/3 rds. Assignment: Become aware of how this rule is used within spaces that you love and apply it to how you place items within your home. 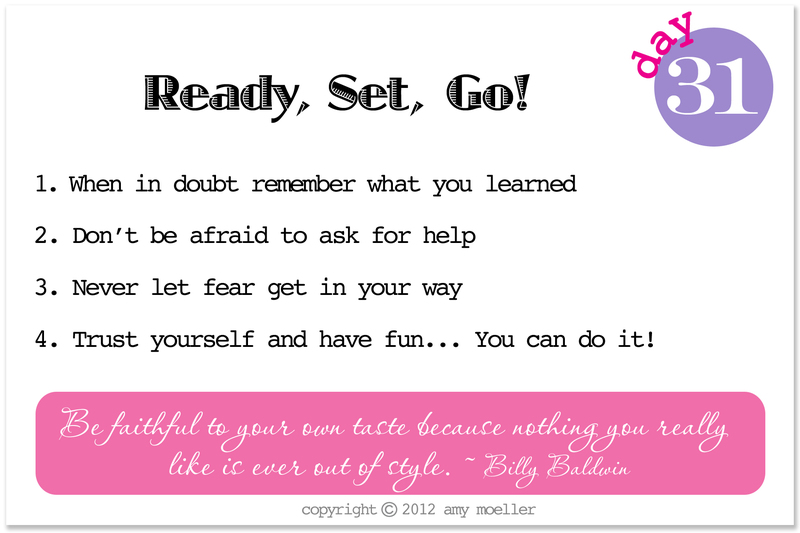 Follow these steps and you’ll find that developing a color scheme is easy! 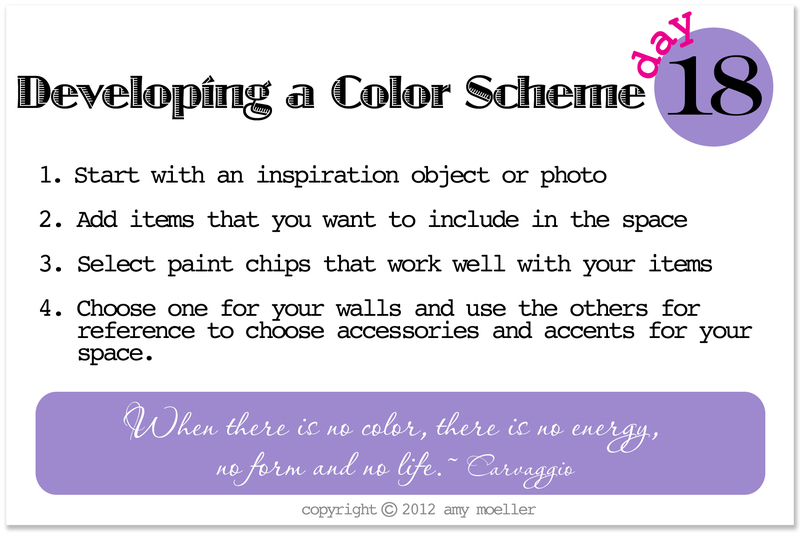 Pull out your inspiration object or photo and use as a starting point for selecting your colors. Take into consideration any objects that you will be incorporating into the space. Select paint chips that work well with your items and that appeal to you. Make sure to look at the paint chip under the light in your space. The lighting at the store may be very different then your lighting at home. Also make sure to tape it on the wall and look at it in the morning, afternoon and evening as a color will look different throughout the course of a day depending on the light source. Choose one color for your walls and keep the others for reference when choosing accessories, draperies, fabric, etc. Assignment: Pick out the colors for your space and staple the color chips to an index card. Store in your purse for reference when shopping.